Run flat tyres are increasingly being used by manufacturers on their new vehicles in a bid to boost safety for motorists. At ATS Euromaster we stock a wide range of run flat tyres at competitive prices. Run flat tyres are designed with a reinforced sidewall which helps prevent the tyre from disintegrating when punctured. This means you can travel to a safe place to change your tyre as necessary. 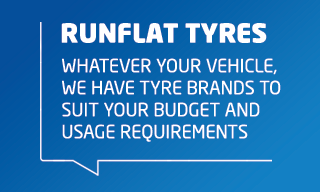 Drivers can access our range of run flats suitable for a range of manufacturers online, with the tyres able to be fitted in one of the 330 centres we have across the UK. Can you repair run flat tyres? The majority of manufacturers advise against repairing run-flat tyres, as the integrity of the tyre may have been compromised if driven on. Run-flat tyres can be purchased online from ATS Euromaster and fitted at one of our service centres around the UK. If a vehicle is fitted with run-flats it is generally advisable to replace like-for-like. How far can you drive on a run flat? Do not drive more than 50 miles on a run flat that has had a puncture. It's very important that you get the tyre changed as soon as you can. It's recommended you do not travel more than 50mph. If you drive more than the 50 miles you risk damaging the wheel of your vehicle, which will cost you a great deal more to repair than the cost of a new tyre.